CL to Make US Debut; 2NE1 in Trouble? 2014 is turning out to be a shaky year for K-pop, and 2NE1 is taking another blow. This time, the rumblings of the group splitting up are beginning to circulate. First, it has been announced that CL will be making her debut in the United States. According to YG Entertainment, she will be releasing a single album next year. Like PSY, Scooter Braun is heading up her advancement into US markets. As CL has become the star of the group, this isn’t too surprising. But, on the heels of this announcement, 2NE1 has faced break-up rumors. Such talk may have been a stretch, but these rumours were given further credibility when maknae Minzy also became a target for speculation regarding her leaving the group. Earlier in the day, reports came out stating that Minzy had taken out references to 2NE1 from her social media accounts. She even changed her Instagram name. However, the “2NE1” has once again reappeared in her bio information. YGE was quick to state it was purely coincidence that the two situations coincided with each other. They also pointed out that the group has schedules. 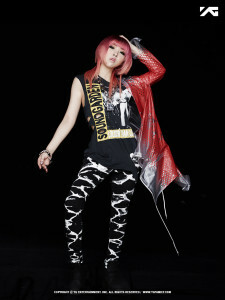 However, the company is suspected of intervening and leading to Minzy including “2NE1” back in her social media bios. Given the current situation in K-pop, and CL’s solo work, it’s not difficult to see how people are on their toes regarding any talks of discord within groups. If there is any truth to the speculation, then Blackjacks will surely be hit hard. Not to mention YG, as 2NE1 is their breakout female group. So, what do you guys think? Is 2NE1 headed for trouble, or is this just much ado about nothing?